You’d be forgiven for expecting Gabriel Gbadamosi’s play to be about our stop and search laws, where police notoriously target black people over white. Instead, Irish-Nigerian Gbadamosi uses a wider lens to explore issues of race in modern-day Britain. Divided into three acts, the first has Tel (Shaun Mason), an abrasive wheeler-dealer, picking up Akim (Munashe Chirisa), a traumatised African refugee desperate to get to the UK. As they drive towards the English Channel, we learn that Akim has lost his family and witnessed unspeakable horrors. In the middle section, two armed police officers keep watch over a London house. They are waiting for Tel, their ‘criminal’, to return. Tone (David Kirkbride) reveals a dubious past, riven by racism, while his ‘good cop’ companion, Lee (Tyler Luke Cunningham), is still coming to terms with being a black transgender man. The final part draws the various threads together. Akim, now a minicab driver, listens to a heartfelt confession as he drives Bev (Jessye Romeo) to Elephant and Castle. 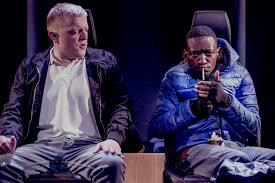 Hugely topical, Stop and Search explores how prejudice and distrust of the other has seeped into our everyday lives. However, Gbadamosi’s finely crafted lyricism, his characters’ unique speech rhythms and ellipses, sometimes impacts on the play’s dramatic tension. In Mehmet Ergen’s taut, if uneven, production the opening scene, in which a white bigot experiences the power of empathy, is the most memorable.